Treatment in adults of ringworm (tinea corporis, tinea cruris and tinea pedis) due to infection caused by dermatophytes such as Trichophyton (e.g. T. rubrum, T. mentagrophytes, T. verrucosum, T. violaceum), Microsporum canis and Epidermophyton floccosum, where oral therapy is considered appropriate owing to the site, severity or extent of the infection, and the infection is not responsive to topical therapy. Onychomycosis in adults (fungal infection of the nail) caused by dermatophyte fungi. 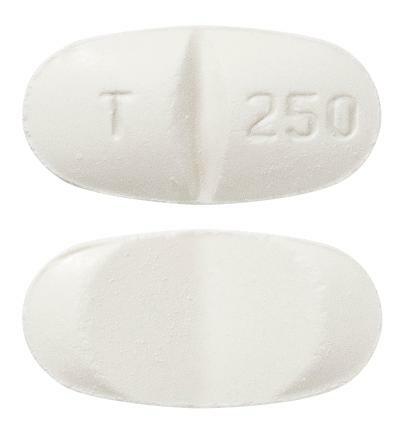 White to off white, capsule shaped, biconvex tablets debossed with 'T' and '250' on either side of the breakline on one side and a deep breakline on the other side.